Take a Hike, Picture Walks! Try a "Picture Peek"
I fully recognize the merits of a picture walk. But a picture walk just isn't for me. You know the time-tested previewing strategy: walking through a picture book with a small group or the class, showing the illustrations, letting them start firing those synapses, make predictions, build the groundwork for a strong understanding, et cetera, et cetera. Even as I write this paragraph, second thoughts are creeping in... maybe I should be using picture walks more often... but no, I'm sticking to my guns. I don't like 'em. I might feel different if I taught a younger grade. But with my third graders, a picture walk is just too dangerous. It's like a license to spoil the ending. Permission to reveal secrets that the author didn't want you to see ahead of time. I know, I know. I'm over-thinking it. I can't help it. A picture walk stresses me out. I took the idea of a picture walk and tried eliminating the part of it that made me anxious: specifically, the "walking-through-the-story" part. So if we weren't going to look through all the pictures, what were we going to do? How about just look at one? And that's when I accidentally did a "picture peek." I was meeting with a guided reading group. I had my six-pack of books ready to pass out. We were starting a new story, one I was familiar with, and I wanted to preview it with them. I avoided my nemesis by turning students' attention to just one particular illustration. "Have a peek at this picture, boys and girls." We talked about what they saw in the picture, made predictions about the characters and the setting. We looked for clues to help us infer what might be happening. I asked some thought-provoking questions about the look on each character's face and what that told us about the interactions between them. 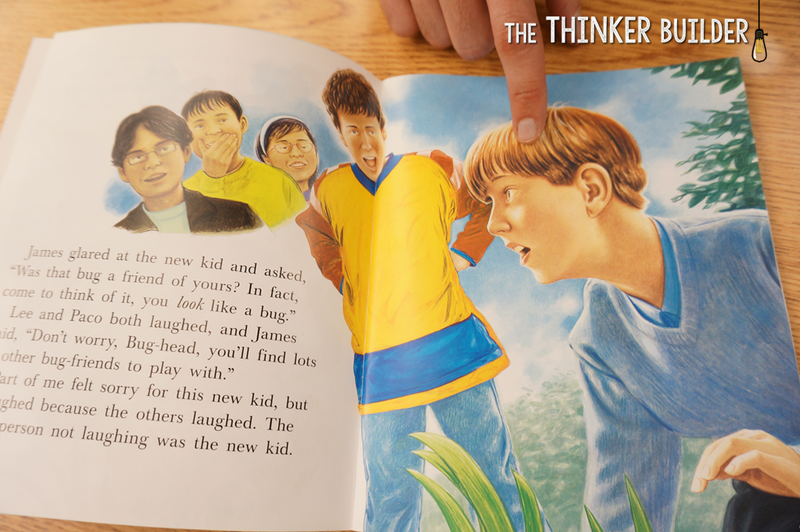 We looked at who was laughing, who wasn't, and the kind of laughing the students thought was happening, as well as the feelings it might be causing. When I asked them which of the characters they thought would be telling the story, they were surprised it would be the girl farthest in the background. We even talked about why the illustrator might put the storyteller in such a position. What could that mean? It was an engaging way to preview the book with just one picture. Have students look at the picture carefully and talk about what they see. Ask students to infer what's happening in the picture and why it might be happening. Ask students to predict future story events based on the picture. 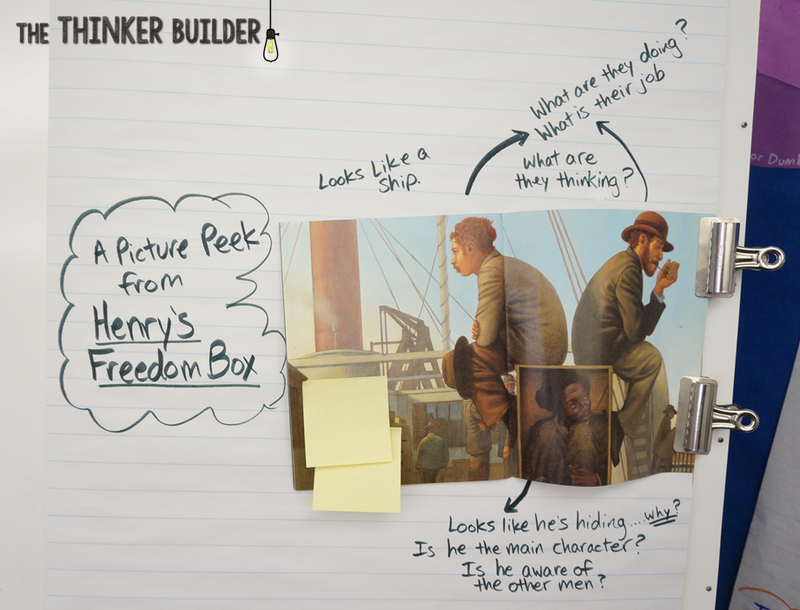 Sometimes I'll use a "Picture Peek" with a whole-group read aloud, especially when the illustrations are outstanding, like in Henry's Freedom Box, by Ellen Levine (illustrated by Kadir Nelson). 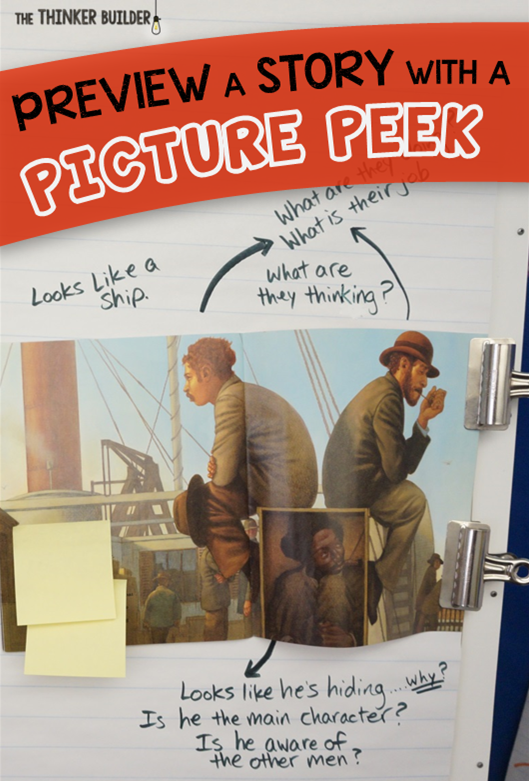 I clipped the book open to an intriguing picture, covered the text with sticky notes to keep the curious students honest, and we began "peeking" into the illustration. With this one, I recorded some of our thinking and questions onto chart paper. After previewing a story with a "Picture Peek," reading the story gains an extra element of interest, especially when we actually arrive at the page at which we peeked. We usually take an extra moment to check and adjust our thinking before reading on. You may already do picture peeks without even realizing it. Simply showing students the cover of the book is similar, right?... since the cover illustration is often taken from the book itself. But I've found that there's something novel and exciting to students about looking at a picture from inside a book that was chosen specifically for them to think about. And just think, no spoiler alerts are needed.